Mission: The Canadian Network for the Detection of Atmospheric Change (CANDAC) objectives include understanding atmospheric change over Canada, integrating ground based measurements with those taken from space, aircraft, and balloons, providing quality controlled research datasets, partnering with international networks for data exchanges and supranational planning, maintaining research critical resources, educating the public, and training skilled personnel. 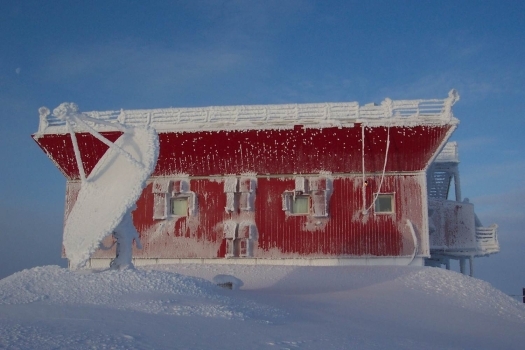 PEARL provides a critical site in the Arctic for making the necessary ground based observations as well as validating those of several satellite instruments. Facility and Environs: The Polar Environmental Atmospheric Research Laboratory (PEARL) began in 2005 by repurposing the Arctic Stratospheric Ozone Observatory (AStrO) Lab built by the Atmospheric Environmental Service of Canada in 1992. PEARL was opened by the Canadian Network for the Detection of Atmospheric Change (CANDAC), a consortium primarily of university research groups, but also partnering with Canadian and US government agencies. PEARL consists of three facilities with the iconic red building, or Ridge Lab, being the most recognizable. It is located on Ellesmere Island, 15 km from the Eureka Weather Station, 610 meters above sea level and at roughly 80°3’11.25”N, 86°24’59.41”W. Responsibility for managing this facility lies with Environment Canada's Real Property Management division. 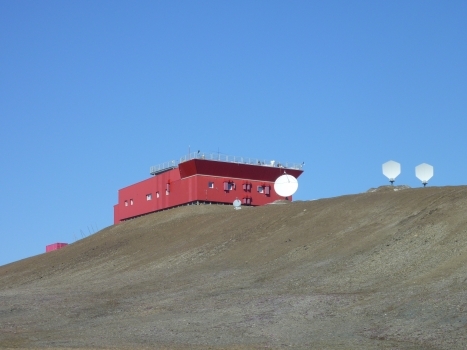 The Ridge Lab includes four large laboratories (total area of approximately 120 square meters) and a roof-top observing platform (total floor area of approximately 350 square meters) for instrumentation. In addition it has an independent backup power source (diesel generator); self-contained water and sewage systems; kitchen; limited living quarters; a three bay garage; a small machine shop; and a safe hut away from the main building that can function independently should a disaster befall the main building during extreme weather. Satellite communications are maintained over two different links (C-Band and K-Band) representing the northern most geosynchronous internet link in the world.